Cory: You guys know how Les always apologizes when he makes us watch bad episodes for the roundtable? I’m never going to do that. Partially because I like to “make” people watch mediocre-to-awful TV, but also because I think that kind of TV can be really compelling in its own way. I chose this episode of The Greatest American Hero because I assumed that it would be pretty bad, and we’d all get a weird kick out of watching it. But while “The Two Hundred-Mile-An-Hour Fastball” has its faults–mostly because ugh, baseball–it’s also mostly entertaining in a supremely goofy and earnest way. Which I think pretty much sums up the Greatest American Hero experience. Just look at the logline for this episode: “Crooks needing cash to swing an arms deal bet heavily on a baseball game, and beat up the star of the team they bet against. Ralph joins the underdogs to make sure they win and the gamblers lose their money.” So it’s not enough that Ralph, innocuous school teacher, becomes a major league pitcher on a whim through the silliest of tryouts, but he does so because there are gambling arms dealers! Sometimes, I try to resist the urge to simply type “#80sTV,” and move on, but here, resistance is futile; this is just ridiculous from top to bottom. I’m wondering how effective comedic superhero stories like this can be. We’re in the midst of an era of superhero stories defined by words like “dark,” “gritty,” and “realistic,” but I hope I’m not alone in saying that enough is enough. Greatest American Hero takes us back to a time when the industry didn’t take superheroes as SERIOUSLY as it does now, but I’m not sure that means the show disrespected the archetype. This episode does a nice job of showing us who Ralph is as just a dude. Though the idea that he can make it onto a professional baseball team is ludicrous, it kind of works because Ralph has a history with the sport and a desire to play it. Making onto that mound isn’t just part of a half-cocked undercover gig; it’s a dream come true. His enthusiasm for pitching creates little moments where he’s cocky (gotta throw that slider) and naive (he and Bill get fleeced on the contract), which in some ways only makes him look more like an idiot, but also reinforces that he’s a guy who stumbled into these gifts. It’s not the most complicated way to tell a superhero origin story, and it’s certainly cheesy, but those small character moments make it worthwhile enough. Les: My apologies are to the readers Cory, not to you guys. I never apologize to you. Yes, The Greatest American Hero is certainly as far as you can get from grim and gritty realism, thanks to its mix of earnestness and knowing ridiculousness. The show comes to us from the mind of legendary showrunner Stephen J. Cannell, a master of developing programs that knew they were lightweight entertainment designed for the sole purpose of getting people to tune in week to week–his credits include such fine shows as The A-Team, 21 Jump Street, The Rockford Files, Riptide and so many more. 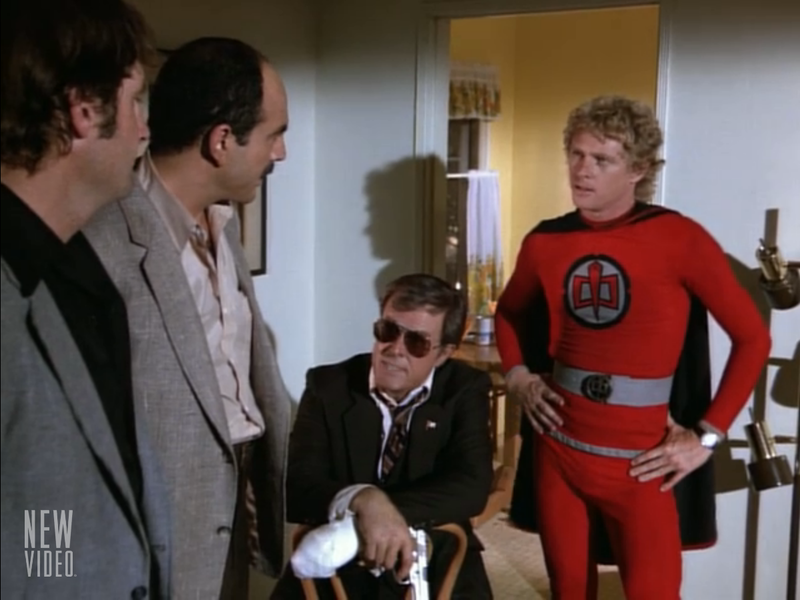 The Greatest American Hero is absolutely in that vein, a show that’s all about an everyman with poofy hair in a silly costume solving problems great and small, grappling with powers beyond his control but doing so in an inconsequential way where his biggest problem is being able to land correctly. And it certainly hasn’t aged well, between the laughable flight scenes*, the moment where a ridiculously 80s song about baseball enters in the middle of the episode, and the light way in which it treats its central conflict. That being said, none of that makes the show bad, and I found it entertaining and not overly idiotic in its goofiness. 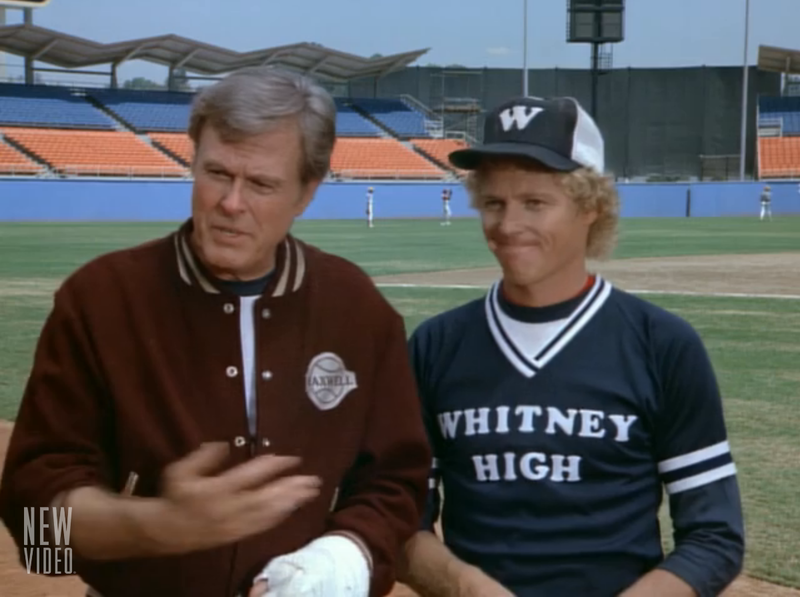 There’s a good chemistry between William Katt and Robert Culp* as his handler Bill Maxwell, an easy rhythm that implies Maxwell’s gotten used to Ralph’s situation—witness the comment he makes that Maxwell broke his hand “again” trying to catch his fastball. I also enjoyed seeing several elements that feel familiar to a viewer of more recent TV, proving Cannell’s influence even today: Chuck‘s setup of a decent and ordinary guy given superpowers is absolutely inspired by this show’s premise, and Neal and Peter’s partnership on White Collar is clearly a spiritual successor of Ralph and Maxwell. *Robert Culp of course making his third appearance in as many roundtable themes, following The Outer Limits and I Spy. Two more roundtables and he gets a commemorative plaque. Cory, you talked about enjoying the way the episode portrayed Ralph as a normal guy, and that was an aspect I appreciated a lot. In most of the shows we’ve watched so far the alter ego of the superhero is treated as secondary to the character: Bruce Wayne, Clark Kent and Britt Reid are all placeholders until the real hero can emerge, deliberate personas thrown up to distract the public. In this instance however Ralph has no mask, nor is there anything keeping him from being recognized—I was very amused at the scene where he and Maxwell emerge from the office and not a single person bats an eye at the fact that the high school teacher turned star pitcher is sporting a ridiculous leotard. But Ralph’s daily life is as important to him as being a hero is—witness how he makes it a priority not to pitch during school hours, or how legitimately hurt he seems by the way his classroom gently mocks the idea of him being a pitcher. I was also relieved the episode didn’t go too far in making either his abilities or his athletic success go to his head, with the only real example of the latter being when he really wants to throw a slider at his last pitch. Cannell talked in interviews about how he wanted the show to be more about real-life problems over traditional heroic exploits, and while he lost that battle with the network there’s still a genuineness to how Ralph’s written and portrayed by Katt that maintained that down-to-earth spirit. Whitney: I didn’t think I would enjoy this episode nearly as much as I did. No one involved ever took themselves too seriously, and I think it turned out pretty well for everyone if only because if you’re out to make a super hero show about a high school teacher with a sidekick/handler FBI agent nothing can be taken too seriously. A lot of things that should probably have mattered more were left out completely or slotted in randomly. (For example, unless I missed something early in the plan we don’t really figure out that Robert Culp is an FBI agent until the very end when he makes the arrest of the manager.) Most of the powers that Ralph has aren’t explicitly defined one way or another; is it super strength? Super accuracy? Super speed? There was obviously some psychic shenanigans going on during the climax of the episode, but does the suit just let him do whatever he wants or are there limits? Again, these don’t come across as plot holes but rather little bits of story that someone decided weren’t as important as the more human moments littered throughout. I was also a huge fan of the scene in his classroom where he explained to his students why he was doing what he was doing even though it seemed crazy to them. It’s framed as a life moment and William Katt does a surprisingly solid job of getting across how Ralph feels about these high school students and why he would take the time to sit down and let them in to his thought process. The other nice part of Ralph as a character was how everything he did wasn’t some holier-than-thou selfless act he could only accomplish because of the suit. Throughout what was basically a sting in order to arrest international criminals, Ralph took moments to remember how he felt accomplishing what every kid dreams of doing. This is underlined a little too succinctly at the end when Bill makes the point to Ralph that people are already forgetting but he says he’ll always remember. Just a little too sweet and sappy for my taste, but again, nothing more than a silly show embracing their aesthetic. I also couldn’t watch this show and its theme song without thinking of this clip the entire time. Never gets old…. J.: I loved this. I loved the goofy special effects, loved the cheesy theme song, loved the class full of kids right of Michael Jackson’s “Beat It” video — loved it. It takes its wacky premise and just owns it, in the way that we’ve mostly forgotten how to do since the 1980s. The key is that, underneath the silliness, this show has a ton of heart, and it’s not afraid to show it. Unlike a lot of other superhero stuff, it remembers that being a superhero can be fun, even if it’s dangerous. And I really like that Ralph is still allowed to have fantasies, even though he’s a superhero: the wonderfully cliche moment of the game-winning grand slam in the bottom of the ninth is clearly Ralph living out the same fantasy he had as a kid, the same fantasy I had as a kid. (Right down to hitting it in Dodger Stadium.) Ralph is the rare superhero who’s actually glad to be who he is. Like you, Whitney, I was kind of baffled at the suit’s powers. To me, it again harkened back to a child’s fantasy: the suit seems to have whatever powers Ralph wants to have, like a kid on the playground. “Now I can fly! Okay, now I’m psychic!” That childlike attitude is everywhere here, and gives the whole show a big lift. And finally, Robert Culp was fantastic. My favorite part of the episode was his reaction when he learns the villains are throwing baseball games to earn money to overthrow half of South America; he just grimaces and says, “That stinks!” It’s a brilliantly light moment in a show full of them. GAH was a wonderful, wonderful show for about a season and a half. ABC asked Cannell to do a superhero show, but Cannell, having no interest in or knowledge about superheroes, decided to sort of parody it by creating a clumsy superhero. Not an inept superhero–Ralph is smart, enthusiastic, honest, not a cartoon–but a clumsy one. Which ties into what seems to be an inconsistency with the powers. In the pilot (for which Cannell was nominated for a writing Emmy), Ralph lost the instruction manual that came with the suit. So he doesn’t know how the suit works or even what it can do. It’s all trial and error. He did get better at it as it went along. Connie Sellecca was pregnant and missed some shows (she was then married to Buck Rogers), so it’s a shame you didn’t get to see how well she fit into the Bill/Ralph/Pam troika. On the other hand, because she’s a lawyer, if she were there, we wouldn’t have gotten the funny bits about the always-confident Maxwell over his head negotiating Ralph’s contract (an illogical plot point–what difference does it make how much he makes when he’s only gonna be on the team two days?). Of course, plots were almost always incidental to Cannell’s best shows, which were always about character, character, character. And action, of course. But interesting characters well cast and the humor that came out of them. There are no jokes in a Cannell show. 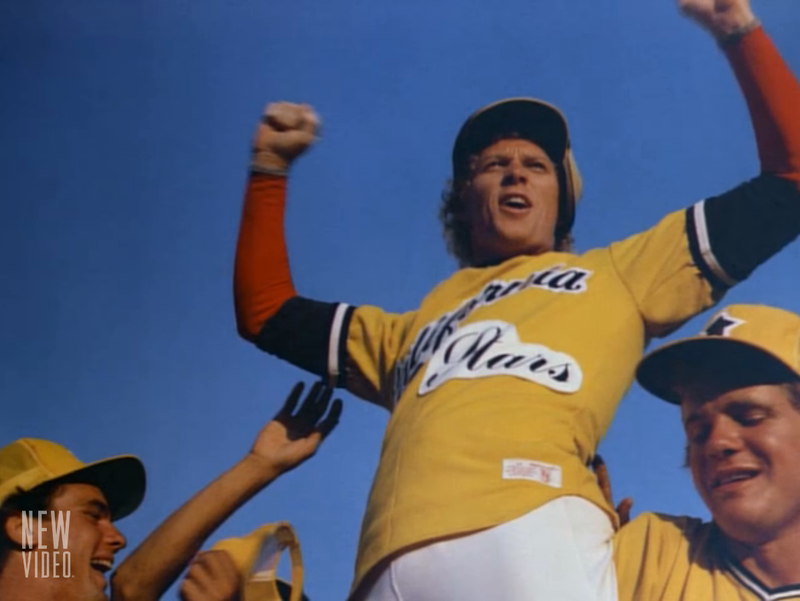 As a baseball fan, some of this ep drives me crazy, like the mesh caps and the idea that the sports media wouldn’t go nutzo over a real-life Sidd Finch playing in L.A.
Culp, man. A legitimately great actor whose only failing was a lack of warmth that kept him off the A-list, although his brilliance at portraying arrogance made him a terrific heavy. On GAH, he used that talent to make Maxwell…well, honestly one of television’s great characters. It’s hard to take your eyes off Culp every moment he’s on screen in GAH, and the button to the scene at the stadium where he chomps on the dirty hot dog Ralph found on the floor is perfectly set up and timed (whether this was in Cannell’s script or something Culp or Georg Stanford Brown improvised, I don’t know, but it sure is funny). You’re right about the chemistry between Katt and Culp, which is interesting (and was there from the pilot on) because Katt and Sellecca initially didn’t get along with the old-school Culp (not uncommon for his co-workers). Apparently, the youngsters did warm up to him (or vice versa), and the extent that GAH works as fun entertainment is the relationships between Pam/Ralph and Pam/Ralph/Bill. There are some Bill/Pam scenes (the sexist Maxwell usually trying to relegate Pam to getting coffee, and her putting the lug in his place, recognizing that he’s a good man and a lonely one, so gently), but usually it was the three together. Well, hell, I guess I wrote more about GAH than anyone will ever read. It’s a show I loved from its premiere, though I didn’t keep up with it when ABC dumbly moved it to Fridays, effectively killing it. I’m glad you guys “got” it and enjoyed it. I’m betting this episode was the season premiere because it ran right after the World Series on ABC (who probably promoed the hell out of it), but the next episode, “Operation Spoilsport,” is even better. Yeah, some of the baseball stuff irked me, too — Ralph clearly balks at least once during his first pitching appearance, and the letters were peeling off of the Oakland Mets (?!) uniforms. But it so far beside the point that it wasn’t much of an issue. He was using a full windup with runners on base too, and there is no rule that says once a batter reaches the batter’s box, he can’t be replaced. I just choose to believe the Stars were not a major league team, but a minor league or semi-pro team. Especially given they need $10 million for the weapons. How long were the odds on the Stars anyway? And how much did they put down as an opening wager? Well, even ROCKFORD’s plots didn’t always make sense. Which is why Cannell could never get a show on the air today. Network suits and online recappers would be screaming about plot points constantly. Sometimes, the story doesn’t really make any difference, and it doesn’t mean the writing isn’t good. This episode is well-written, regardless of its plot. You brought up WHITE COLLAR below, which is one of the USA series that receives short shrift, I think, from critics and online commenters. It feels like a Cannell series, except for the squealing tires. That’s a compliment. Thanks as always for the additional research Marty! I did think it was odd that Pam was barely part of the episode, especially given Sellecca was in the opening credits, but your explanation makes a lot of sense. (And amusingly enough, her husband at the time was Buck Rogers himself, Gil Gerard.) Going to a second White Collar parallel, it’s exactly what they did to Elizabeth in the early second season when Tiffani Thiesen was pregnant, sticking her behind a lot of hilarious green screens standing in for other cities. Maxwell was indeed really good – I’ve liked Culp in all three of the episodes we’ve watched to date, and I think this is the most I’ve liked him. He’s got a brash and assertive air which could translate into being condescending with Ralph, but you can tell he likes the guy and enjoys playing hero with him. The hot dog scene and his arrest of the coach were both great moments. Looks like this episode was indeed the second season premiere, except for some reason Hulu has it as the second episode while Operation: Spoilsport is the first. And based on your recommendation I’m going to give Spoilsport a shot. I would bet that “Spoilsport” was the first episode produced, but ABC elected to start with “Fast Ball” because of the World Series connection (I looked it up–ABC did broadcast the WS in 1981). Almost any first or second season show is worth watching. Some of the third-season shows are good, but the decrease in quality is evident. If you liked “Magic Mirror,” you should probably check out “Lilacs, Mr. Maxwell,” which Culp wrote and directed. It’s Maxwell-centric and a major clash in tone with the other GAH episodes. It’s very good on its own, and could only have been aired at the end of the season. If you guys ever do COLUMBO, you should do one of Culp’s shows. He and probably Jack Cassidy were the quintessential Columbo heavies, precisely because of that condescending air you mention.